Earlier this week, ... I found myself going through my Instagram DM. Amongst the weird spam ones, I found this DM from someone who's been following my blog for quite some time, I recognized her username. She asked my why I rarely have a full blown, real, proper blog post. Then I immediately went through my blog, and mumbled to myself, "She got a point there, ...."
Well, I stared at the message for quite awhile before replying "I don't know either." After quickly shooting a lot of thank you-s for reading my blog, or the lack thereof, I just sat there - in front of my vanity - thinking about how this fiasco started. To be honest, ... My outfit choices got boring. 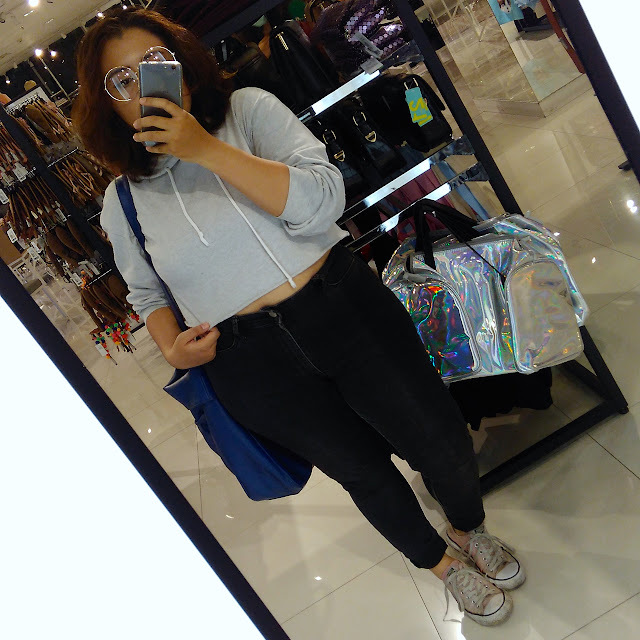 The so many months spent to care less about what I wear out in public and more about how I needed to finish my compulsory paper (then eventually graduate), I practically lives in skinnies and tees - sometimes pullover, simple tank and cardigan combo, or, the fave one, cropped hoodies. It feels weird to wear dresses, skirts, or even slightly dressing up. Think I need to step up my blogging game, .. yet, as per usual, .... Easier said than done. T'was good so far. Have a nice remaining of the month!